Present state: Demolished but station masters house extant in use as aprivate dwelling. Notes: Griffiths Crossing station was on the Menai Bridge – Afon Wen line which opened in stages between 1852 and 1871. 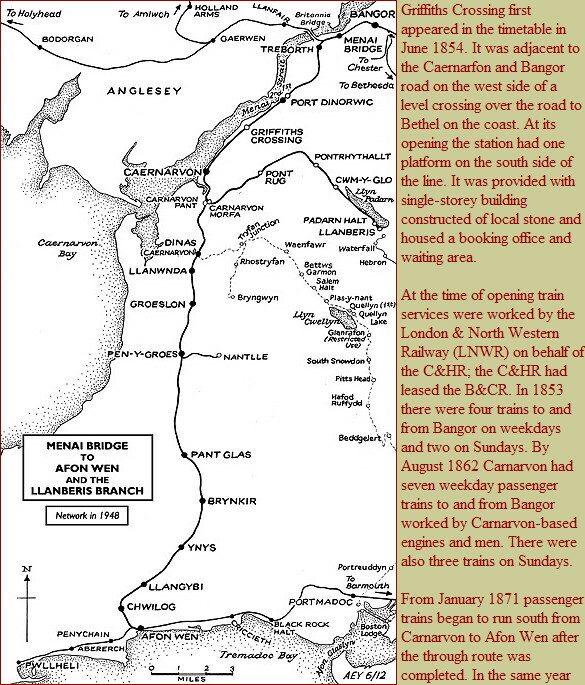 The station was originally part of the Bangor & Carnarvon Railway (B&CR) which was incorporated on 20 May 1851 to build a line from the Chester & Holyhead Railway (C&HR) at Menai Bridge to Caernarfon. The single-track railway opened to Carnarvon – the spelling adopted by the railway company - for passenger services on 1 July 1852; goods services followed on 10 August 1852. In 1867 the B&CR was absorbed into the C&HR. 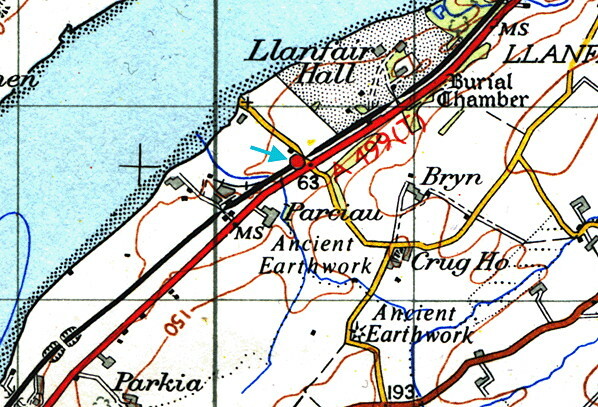 In 1872 the section of line between Carnarvon and Menai Bridge was doubled. authorisation was given for the doubling of the original B&CR, and work was complete by 1872. Griffiths Crossing was provided with another platform on the north side of the line which became the ‘up’ (Bangor direction) platform whilst the original became the ‘down’ (Afon Wen direction). The new platform was provided with a simple waiting shelter built in a similar style to the original building, which stood opposite it on the other platform. The platforms were also built from stone and were 320ft long. Passengers crossed the line using the level crossing. 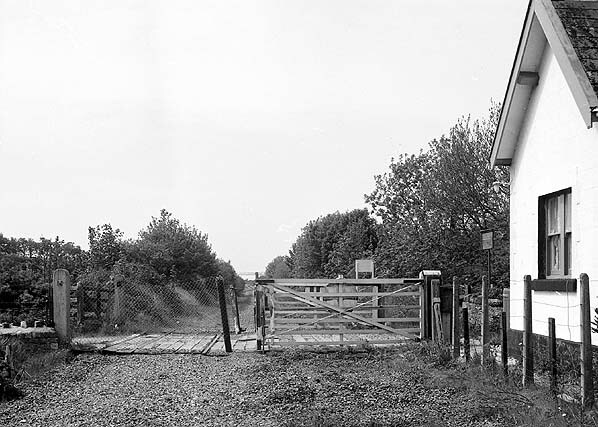 On the east side of the crossing, north of the line, was a single-storey stationmaster’s house. To the west was a goods siding with loading ramp to the south of the line. By 1879 the C&HR had been formally absorbed into the LNWR although it had effectively been part of that company’s network for many years. The 1881 census shows that the Station Master at that time was Henry Payne. In December 1895 Griffiths Crossing had five northbound and six southbound departures on weekdays as shown on the table below. No trains called on Sundays. In 1911 a ceremony was held in which the future King Edward VIII was invested as Prince of Wales at Carnarvon. Part of the event was a procession into the town led by King George V and Queen Mary. Griffiths Crossing was chosen as the location at which the royal part would alight. 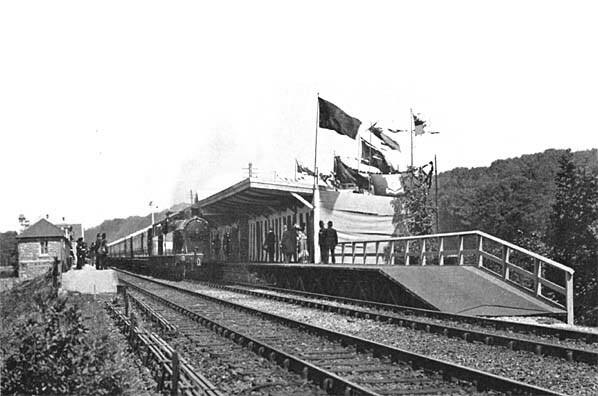 The station facilities were considered inadequate for the royal party, so temporary timber structures were erected which included an extension to the down platform and a canopy. The Royal train stopped at Griffiths Crossing on 13 November 1911. After the event the station reverted to its basic form. Griffiths Crossing had been popular with excursions and Sunday School outings and, in the years running up to the Great War, units of the territorial army travelled to the station to carry out exercises in the adjacent fields. In July 1922 there were eight northbound departures and only five southbound on weekdays as shown in the table below. There was no Sunday service shown. On 1 January 1923 Griffiths Crossing became part of the London Midland & Scottish Railway (LMS). The LMS summer timetable for 1932 showed only three trains to Caernarvon and one to Bangor Monday to Friday. On Saturdays there was an additional working both to Bangor and to Caernarvon. The sparsely populated catchment area of the station had made it unremunerative, and in its later years it was demoted to a halt. The LMS closed it to passenger services on 5 July 1937. The platforms and buildings were demolished shortly afterwards but the goods loading dock remained, as did the stationmaster’s house. There had been a siding that served the Parkia brickworks, west of Griffiths Crossing on the north side of the line. It had fallen out of use just before the Second World War but, with the start of the conflict, the works were returned to use as an underground petrol store, and an additional siding was laid. After the war the facility became the Dow Mac precast concrete works. In 1950, on the level crossing which provided access to the works, a lorry collided with the 4.04pm Bangor to Pwllheli train which resulted in the death of the lorry driver. The line remained busy into the 1960s but, following the closure of Caernarvon and Afon Wen section in December 1964, it went into decline. On 6 July 1964 Griffiths Crossing closed to goods, and in the second half of 1966 the line through the station was singled, the former down line being lifted. the Ferodo factory. The platform stood on the trackbed of the former down line. It was used only once and then removed. On 4 August 1969 goods services on the line ended, followed by the remaining passenger trains with effect from 4 January 1970. However on 23 May 1970 a fire on the Britannia Bridge isolated Holyhead from the railway network. Holyhead was at that time an important freightliner depot, so Caernarvon was pressed into use for freightliner services and received its first train on 15 June 1970. Freightliner trains passed through the site of Griffiths Crossing until 5 February 1972. The line then closed completely and was lifted shortly after. 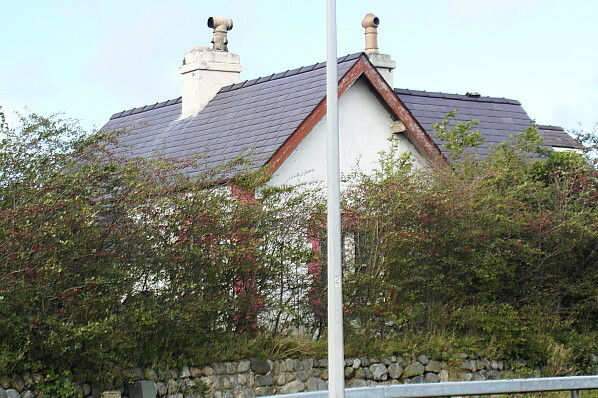 The site was partly lost under a road improvement scheme, but the stationmaster’s house was still standing in 2012. Caernarfon a distance of 2 miles. 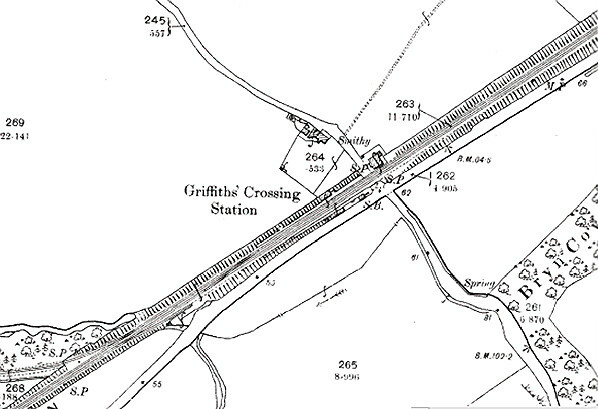 Griffiths Crossing station as seen on a 1900 map. 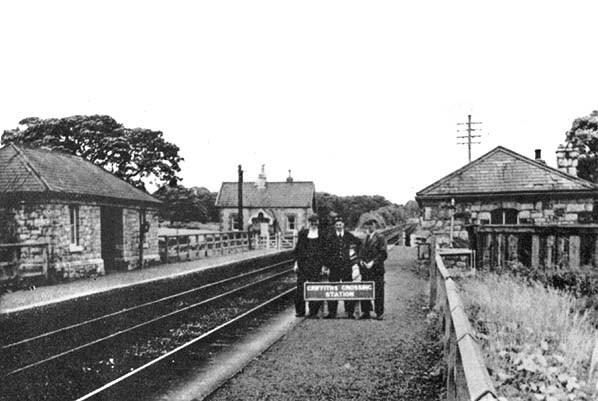 Griffiths Crossing station looking north-east at the time of closure in 1937. Station staff pose a name board. The picture clearly illustrates the facilities at Griffiths Crossing. 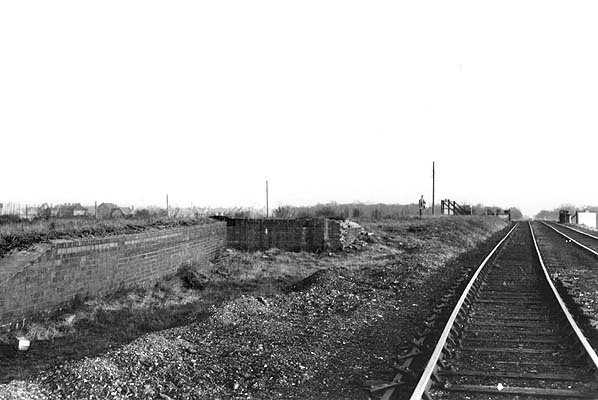 The goods platform at Griffiths Crossing which lay to the south-west of the passenger station seen in the 1950s. 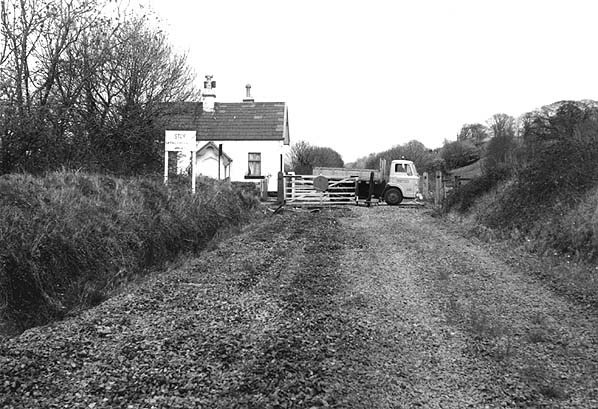 Looking north-east at the site of Griffiths Crossing station in 1973. No trace of the platforms remained but the station masters house was extant. The level crossing gates were also still in situ. Griffiths Crossing station site looking south-west towards Caernarfon in the mid 70s. Track could still be seen embedded in the level crossing. 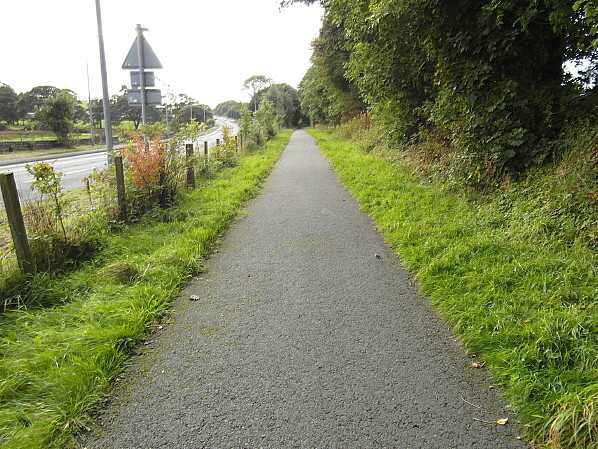 The site of Griffiths Crossing station looking south-west on 28 September 2012. The Griffiths Crossing station masters house seen on 28 September 2012.